Have you seen them: the plump pineapples, bright red radishes, compact Brussel sprouts, heady variety of apples? 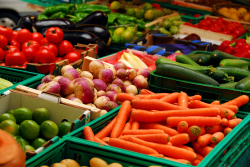 The produce aisle is bursting with healthy, delicious fare. Delicious, that is, for the over-30 crowd, less so for the under-10’s whose favorite orange food is mac and cheese. Why is it that so many children refuse healthy fare, clamoring for processed, starchy, high-sugar, high-fat foods instead? 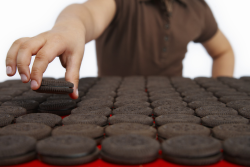 Why do we need to plead with our kids to take one more bite? Whatever happened to pleasant family dinners…? The first question is a matter of science. Processed foods are engineered to have just the right mix of sweet, salty, fat to hook us, leaving us craving more. Culture plays a role, too, with less-healthy foods presented as treats (and who wouldn’t want more treats), and healthy foods as (ho hum) must-haves. To get kids to eat better, buy less of the junk, more of the good stuff and present it in fun, interesting ways. Involve your kids in cooking, make theme nights (international foods, rainbow fare, etc. ), eat in a healthy way yourself. Nutritionists say it takes upwards of 14 presentations of a food to get past the unfamiliar yuck-factor – you know, when kids say they don’t like something they’ve never even tried. I’m going to assume you know the basics, though, and will focus instead on taking the fight out of food. Meals should have a beginning and an end. Forget having your kids sit at the table until they choke down every last bite. And don’t endlessly coax reluctant eaters. Serve small amounts of whatever you want your child to eat. When mealtime is over (15-20 minutes is plenty of time for a meal), it’s over. 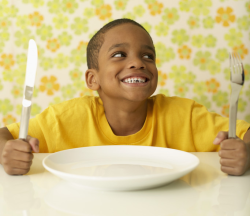 If your child has substantial food left on his plate, wrap it up and put it away. The next time he’s hungry, get the plate back out; he needs to finish that before moving on to something else. Five small string beans, a quarter of a chicken breast, a small wedge of sweet potato. Use a normal-size plate, and separate foods. Full plates are daunting to reluctant eaters, and foods touching one another add unnecessary complications for kids with sensory issues. 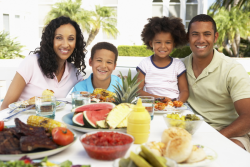 Kids are welcome to ask for seconds of favored foods – after finishing firsts of everything. No toys, books, or screens of any sort at the table, and no getting up once the meal begins. Wigglers do much better when their feet are grounded. Get a stool to slide under the table, or invest in a band to put across the legs of your child’s chair. Consider a seating disk or wedge (like those made by FitBall) which will engage your child’s core and help her stay comfortably seated while eating. Use a simple counting system like 1,2,3: Magic (see Ending Time Out) to set limits on fussing, complaining, and getting up from the table. Impose a brief time-out if your child gets to 3 (he can return to the meal when time-out is over). For chronic food-fussers, consider adding an incentive – an after-dinner game with Mom or Dad – for meals without 3’s. Many children have the mistaken notion that they have to love a food to eat it. The truth is we all have a small-ish set of foods we adore, a small-ish set of foods we can’t stand, and a large set of foods in the middle. We want our children to eat those middle-foods, and to eat them without complaint. This goal is more easily accomplished with a limited no-thank-you system. For children ages 6 and over, find 3 tokens of some sort – poker chips, pompoms, polished stones. Put them on the table, next to your child’s place. These are his "no thank you" tokens to be used over the course of a week. Your child gets to decide when and how to use his tokens – each giving a free pass on one specific part of the meal. Allow your child to make his own strategic decisions: no thank you on the goulash (in which case it would be okay to have more pasta), no thank you on the zucchini, etc. It makes a big difference to kids to have some measure of control, and teaches them to eat (and eventually grow accustomed to) that large set of so-so foods. Most children do a remarkably good job deciding when and how to use their tokens. If your child hasn’t yet learned to pace himself (is in danger of burning through all 3 in a day or two), ask, "Are you sure that’s worth a token?" when he says he wants to use one, but ultimately it’s up to him. Of course, when his tokens are gone, they’re gone and you’ll shift to the wrap-it-up-for-next-time method described above.